In William Kent Krueger's latest pulse-pounding thriller, Cork O'Connor's search for a missing man in the Arizona desert puts him at the center of a violent power struggle along the Mexican border, a struggle that might cost Cork everything and everyone he holds most dear. On the Fourth of July, just as fireworks are about to go off in Aurora, Minnesota, Cork O'Connor and his new bride Rainy Bisonette listen to a desperate voicemail left by Rainy's son, Peter. The message is garbled and full of static, but they hear Peter confess to the murder of someone named Rodriguez. When they try to contact him, they discover that his phone has gone dead. The following morning, Cork and Rainy fly to Coronado County in southern Arizona, where Peter has been working as a counselor in a well-known drug rehab center. When they arrive, they learn that Peter was fired six months earlier and hasn't been heard from since. So they head to the little desert town of Sulfur Springs where Peter has been receiving his mail. But no one in Sulfur Springs seems to know him. They do, however, recognize the name Rodriguez. Carlos Rodriguez is the head of a cartel that controls everything illegal crossing the border from Mexico into Coronado County. As they gather scraps of information about Peter, Cork and Rainy are warned that there is a war going on along the border. "Trust no one in Coronado County," is a refrain they hear again and again. And to Cork, Arizona is alien country. The relentless heat and absence of water, tall trees, and cool forests feel nightmarish to him, as does his growing sense that Rainy might know more about what's going on than she's willing to admit. And if he can't trust Rainy, who can he trust? 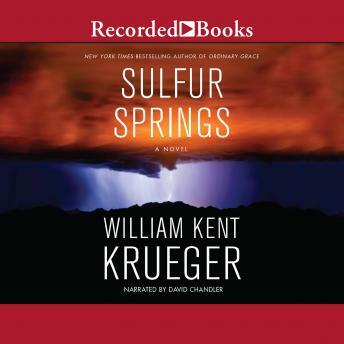 Featuring Krueger's signature talent of "creating strong characters, building drama and conflict, braiding in Indian legend and spirituality, and spinning a good yarn" (Minneapolis Star Tribune), Sulfur Springs is a fresh, exhilarating, and white-knuckle mystery starring one of the greatest heroes of fiction. Way too much political posturing. I've enjoyed many of Mr. Krueger's books until I heard this one. I think this is probably the last one I will purchase. I was looking forward to the end of the book so that I would not have to listen to any more of his political statements.